Front Suspensions|Brandon, FL :: Scott's Automotive Inc. The four wheels of a car work together in two independent systems — the two wheels connected by the front axle and the two wheels connected by the rear axle. That means that a car can and usually does have a different type of suspension on the front and back. Much is determined by whether a rigid axle binds the wheels or if the wheels are permitted to move independently. The former arrangement is known as a dependent system, while the latter arrangement is known as an independent system. In the following sections, we’ll look at some of the common types of front and back suspensions typically used on mainstream cars. Dependent front suspensions have a rigid front axle that connects the front wheels. Basically, this looks like a solid bar under the front of the car, kept in place by leaf springs and shock absorbers. 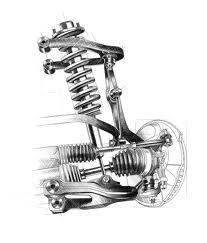 Common on trucks, dependent front suspensions haven’t been used in mainstream cars for years.